White House: Evidence Syria Used Chemical Weapons : The Two-Way The administration has warned Syria against using chemical weapons but does not say how this might change U.S. policy toward the Syrian regime. 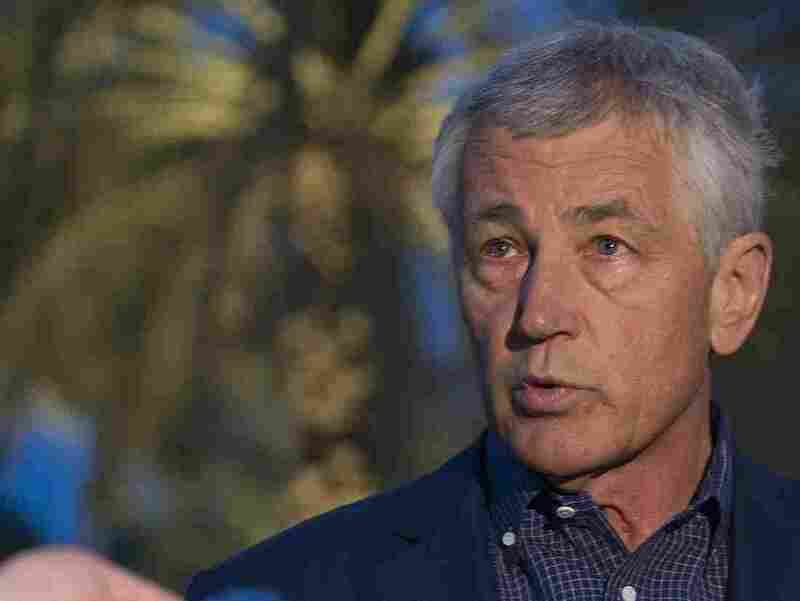 Secretary of Defense Chuck Hagel speaks with reporters on Thursday in the United Arab Emirates after reading a statement on chemical weapon use. A White House official reiterated much of what was in the letter sent to Capitol Hill, but added that "all options were on the table in terms of our response." The official said that reports of the use of chemical weapons in Aleppo in March was one of the incidents being examined. Speaking on All Things Considered, Sen. Bob Corker, R-Tenn., the ranking minority member on the Senate Foreign Relations Committee, said "we have to step up our ability to respond" if it emerges that the Assad regime used chemical weapons. He said the U.S. needs to support moderate rebels so their ability to respond to Assad matches those of rebel fighters linked to al-Qaida and other extremist groups. "NPR has sources in the region, doctors who say they have responded to patients who say they were experiencing symptoms consistent with the use of chemical weapons, and that these doctors are sending tissue samples to the U.S. We don't know if that's the same type of evidence the intelligence community is looking at." Larry added that U.S. intelligence officials say the possibility of the use of chemical weapons in Syria is a "strong maybe" rather than a "slam dunk," a term that was used to describe Iraq's weapons of mass destruction, which were never found. In response to the White House statements on Syria, Sen. John McCain (R-Ariz.) says: "I hope the administration will consider what we have been recommending now for over two years of this blood-letting and massacre — to provide safe haven for the opposition to operate." The White House has acknowledged that U.S. intelligence assessments indicate "with varying degrees of confidence" that the Syrian regime has used chemical weapons during the country's ongoing civil war, but has cautioned that it still needs more evidence. Secretary of Defense Chuck Hagel, speaking in the United Arab Emirates, said that such an action "violates every convention of warfare." The Associated Press says Hagel did not offer details on what kind of weapons were used, how much chemical was involved or whether casualties resulted. But Secretary of State John Kerry was quoted by the AP as saying two attacks were thought to have taken place. Reuters quotes Britain's Foreign Office on Thursday as saying that it also has evidence of chemical weapons use by Syria and calling on President Bashar Assad to cooperate with international investigators to prove that he had not sanctioned their use. "We have limited but persuasive information from various sources showing chemical weapons use in Syria, including sarin. This is extremely concerning. Use of chemical weapons is a war crime," a Foreign Office spokesman said in a statement. President Obama has described the use of chemical weapons as a "red line" and a "game changer," suggesting that it could prompt the U.S. and perhaps other Western countries to intervene more directly in Syria's civil war. "Given the stakes involved, and what we have learned from our own recent experiences, intelligence assessments alone are not sufficient — only credible and corroborated facts that provide us with some degree of certainty will guide our decision-making ..."
" 'Small scale? Varying degrees of confidence? The leaders of the Free Syrian Army are certain that chemical weapons are being used in Syria, so we find this whole statement odd,' said Musab Abu Qatada.
" 'We've noticed that the American administration only works according to its own needs,' said Abu Qatada, who uses an alias. 'We've started to believe that there is a conspiracy in the West to support the regime in its quest to oppress the Syrian people,' he said via Skype. But if Washington 'truly' wants to help Syria, it will use this finding to start arming the Syrian rebels, he added."